Dillard's 2018 Nutcracker Sweet | First Edition 1E Ponies Figurines | One Price Low Flat Shipping! From the Trail of Painted Ponies Holiday 2018 Dillards Exclusive, Nutcracker Sweet Figurine. Designed by artist, Julie Karnath. Made of stone resin. Measures 10.5" tall. Comes in specially branded Dillard's Painted Ponies collector's box. 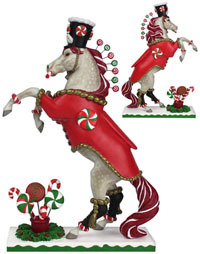 This delightful holiday figurine is alive with merriment! The base has glistening snow and every accent boasts rich detail. Over the years there have been many imaginative interpretations of the Nutcracker, which tells the tale of a little girl and her favorite toy, a funny-looking nutcracker carved to look like a soldier, who whisks her away to a magical kingdom populated by dolls. Adding something new and unique to the holidays this year is a fancy sweet-toothed Painted Pony nutcracker who is dressed in gold braid and tassels, with frosting on his hat, a candy cane in his mouth and a bucket of candy beneath him, dancing in merriment as he performs his own version of this classic Christmas story.